As my Aqua Apron Sisters and I get ready for our annual Mother's Day Brunch, I wanted to share with you one of our most favorite girlie treats. A party just isn't a party without them. Lots and lots of them. Why? No clue. They are not puffy, do not involve any ingredients that have involve the word puff, yet that is the name and we are sticking with it. They are sweet and cute and bite sized and happiness all in one little cup. What do you need for these super easy non-puffy little Puffs? If you have a 24 piece cookie dough pack, place one of each in a mini muffin pan. If it is a 12 piece dough, break each one in half. I happen to have a silicone mini muffin tin which I love. They pop out super easy. But if you have a regular metal mini muffin tin, be sure to Pam or grease it well first. Have you ever been invited to a Pampered Chef party and didn't know what to buy? Now you do. 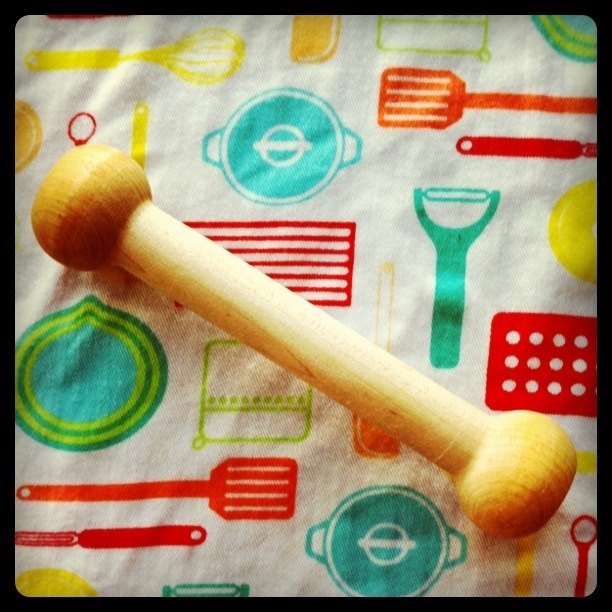 You NEED this little wood handled wonder, the magical Tart Shaper. I don't use it much, but I am so very glad that I have it. When it comes out of the drawer it means it is Puff time. Puff time equals happy time. Pull the cookies out when they are almost done. I usually shave a few minutes off of what the package recommends, so they are soft enough to press little indents with the tart shaper. Be quick. As soon as they start to cool, they will crack as you press them down. After they have cooled in the muffin pan, transfer them to a cooling rack. While the happy cookie cups are cooling, combine the cream cheese, Cool Whip and sugar in a bowl. Whip together with an electric mixer on high. Top with sliced strawberries, blueberries, raspberries or your favorite combination. Then try to eat just one. Dozen. MMMMMMM! I can't wait to make these! They look delish and easy peasy! I have this idea that maybe you could write the titles to all of my future posts...Im just saying its a gift you have girl...can I pay with paypal? I can't wait to go make these! What a fun party snack/dessert!! So easy too! Thanks for the step by step! you are the queen of easy recipes! thank you! i love anything that involves easy ingredients like that. and i want to come to your girl parties ... looks like so much fun. These look so yummy! I'm going to have to make them! You have a great group of friends there. what in the world. you totally threw me with the pre-made sugar cookie dough and that wooden dumbbell. you are a genius and i fully agree with andrea. Im laughing right now because I used to be a PC consultant. IM not anymore but I have to say: they have a bunch of pretty ingenious little tools and things-in case you never know what to buy. Like the glass batter bowl(that you can bake cakes in right in the oven), the spatulas that last for 13+ years, and yes...we love the mini tart shaper too. Lots of goodies(and yes that totally just sounded like I was back at my old job). Sorry. You always come up with the best (and easiest) desserts!! Hugs to you this Mother's Day. OH MY!!! 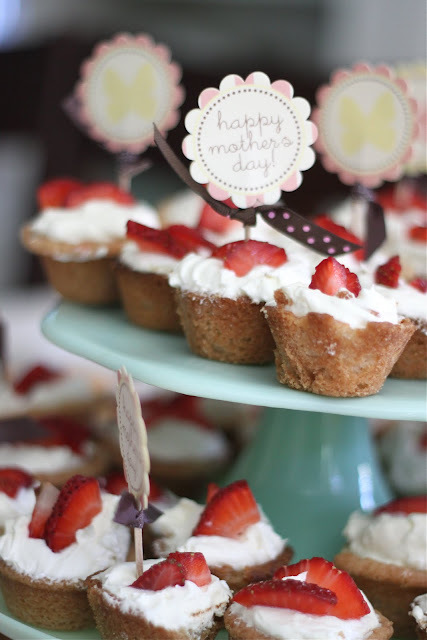 I think I will be making these for myself for Mother's Day. That means I don't have to share them, right? Seriously, this looks too good to be true. Too easy to be good! But it looks so good! I have got to try it:) Thanks for sharing this. Great idea!!! these "Puffs" look simple and YUMM!! My little puffs just came out of the oven. :) Thanks! Those look fantastic! Yum! 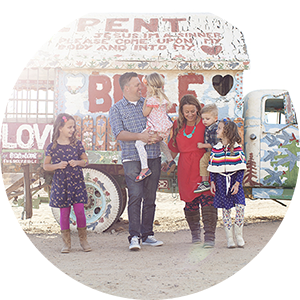 I just found your blog a few days ago and just love it! i want to eat 137 of these puffs right this very second. love how easy they are. love cream cheese mixed with any type of sugar. love strawberries. love sugar cookie dough. i probably wouldn't love how puffy 137 of them would make me. but it might be worth it. hope you had a happy mother's day, Julie! Oh my goodness! I made those darling little puffs for Mother's Day...I thought my daughter and I could sit and eat them while her children(my grandchildren) ran around and watched us eat! Well, they had to try them too! I even had the tart shaper in my drawer and put it to good use! Thanks for the yummy recipe...now all my weight gains can be blamed on you! Such an easy recipe to make!! I will be making Puffs tonight to take to my lovely co-workers tomorrow...(even borrowing that PC tart tool so I can get it right!) Unfortunately this taste group is a bunch of teachers and we'll eat anything put in the teachers lounge...BUT I can't wait to lick the beaters and the bowl. Thanks!! This makes a yummy mousse like pudding - or - I love to use it as a frosting for cakes and cupcakes. Watch out for lots of hits on this recipe from Hays, KS! Took them to a womens brunch at Church this AM. Loved by all!